George Farmer responds to a challenge to set up a high-end artificial aquascape for fancy goldfish. Goldfish and aquascaping are two words rarely used in the same sentence. So when PFK commissioned a set-up for fancy goldfish I looked forward to a new challenge. I had never kept high quality fancy goldfish before and was excited about keeping something that contrasted so much with my usual taste in fish. aquatic plants, they suited the style I wanted to achieve. Due to the high visual impact nature of fancy goldfish the planting and hardscape design would have to be striking and not necessarily naturalistic. However, basic composition rules can still be implemented effectively, such as the positioning of colourful plants and dominating hardscape. I visualised the design… tall, spiky plants contrasting well with the round shape of the fish. Smooth round stones and pebbles would complement the goldfish profile and complete my desired ornamental look. Large stones would hide the lower portions of the plants and smaller pebbles in front of them would help create a visual flow throughout the aquarium. Some low plants would creep over large stone, creating a nice foreground. The tallest plants on the left and shortest on the right would help give a pleasant sloping effect, with plenty of swimming space at the front and ends of the tank. 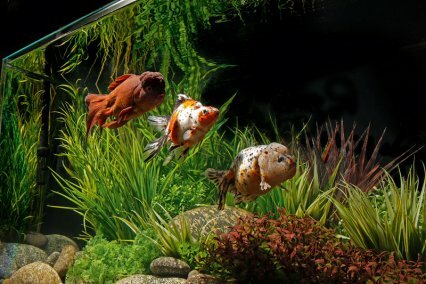 There’s always plenty of debate on recommended aquarium size for goldfish. Even fancy varieties can grow quite large and need lots of room and good filtration to cope with their wastes. As far as swimming space is concerned, PFK suggests sticking to the 'six times rule' and using a tank that’s at least six times the typical length of an adult and twice the width. If you consider that a good-sized fancy will hit 15cm/6” then a tank of around 36” x 12” would be the minimum — but the bigger the better! The six goldfish came to me from Star Fisheries and are quite large (much bigger than I expected when planning this set-up) with the biggest, a beautiful Chocolate oranda, measuring almost 15cm/6" total length. PFK recommends a smaller number of fish — say three or four — or a larger tank for six of this size, long term. Goldfish produce lots of waste and have a relatively high oxygen demand, so good filtration is essential. However, flow rate should not be too high as fancy goldfish don’t have the easiest time swimming. I opted for two large external filters, each holding almost 10 l/2.2 gal of mature biological media. To ensure good oxygen levels I pointed the filter outlet up to agitate the surface and against the back glass to prevent excess flow throughout the water column. Two to three one-third water changes are carried out weekly to help maintain excellent water quality — and that’s something goldfish really deserve. The tank lends itself to this set-up, being relatively tall and wide, so suiting the tall-bodied fish. 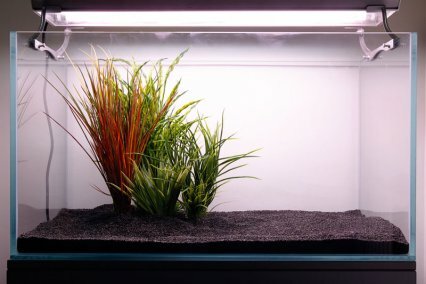 OptiWhite glass gives maximum clarity and, with overtank lighting, gives an enhanced perspective to the whole aquascape. Lighting spectrum was also chosen to give best colour rendition, with a pinkish tube and full-spectrum tube used to bring out the colours of fish and plants to great effect. The photoperiod is limited only to viewing times to help reduce nuisance algae. We used our studio kit on this set-up. However, you can get this look for less. Go for a tank of around 90cm/36” or more - it’s cheapest to buy a complete kit, even though you won’t need the heater. We used lots of plastic plants in this set-up (about £50-100 worth), and some high-end fancies (around £50 each). 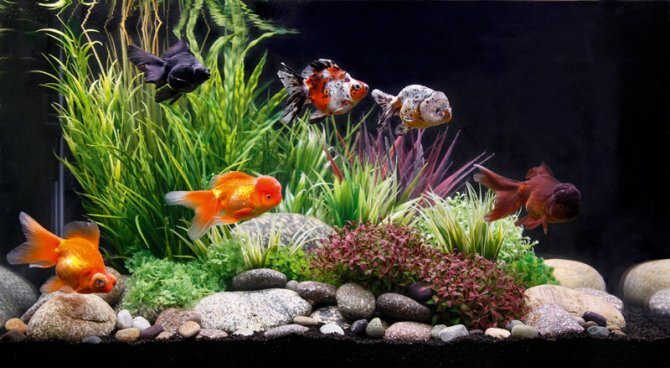 However, the plants and fish both start in price at just a few pounds, so you can spend as little or as much as your budget allows. A tank of this size should hold three or four small or medium fancies. 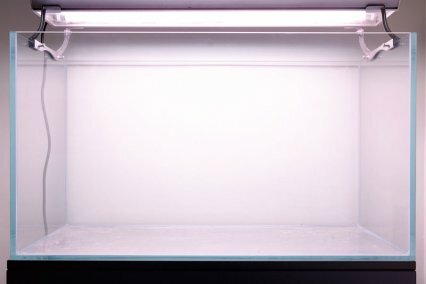 I am using an 80 x 45 x 45cm OptiWhite braceless rimless aquarium with 10mm glass. The low iron increases clarity and is noticeable with thicker glass. The aquarium is on a matching cabinet with overtank luminaire. A larger tank would be more suitable than mine. Ten kilos of Unipac black gravel are added. I’m not after a thick layer as there is no live planting. Substrate depth is just enough to cover the plants entirely. The gravel contrasts with the planting and fish, especially in combination with a black background. The tallest plastic plants are positioned. I want a sloping aquascape, so the tallest plants are positioned over the left. Four separate plants are used, grouped with leaves intertwining for a natural look. Most plants are spiky rush types to contrast with the smooth stones. The largest stones are positioned around the bases of the plants. They add interest and hide the bottom of the plants, acting as an effective transition from the flat substrate. The largest stones are heavy, so handle carefully to avoid dropping them on the glass. Remaining plants are added, taking into account height, leaf shape, colour and texture. Spend time experimenting with different plants in different positions, and the same applies when arranging the stones. This is plastic’s great advantage over real plants! Smaller stones and pebbles are added around the largest stones to further create a natural appearance with nice transitions in perspective. Although the set-up is quite artificial we can still use basic aquascaping principles to create something that looks attractive. Tapwater is added via a hosepipe from the garden. The tank holds almost 160 l/35 gal, so this saves trips with a bucket. The water is very cool and there’s condensation on the glass. I wipe it to prevent any drips settling on and spoiling the new cabinet. After fishless cycling the tank is ready for fish. No heater is required for goldfish and lighting is on only when the tank is viewed. A tank of this size is better with three or four fancies, rather than the six large ones added to this set-up. Star Fisheries supplied me with six goldfish of five different varieties, all looking marvellous. They really are special, especially compared to the usual specimens we see in some retail shops. Similar to Lionheads, Ranchus have more arched backs and shorter tails tucked in at a sharp angle.The head is the most prominent feature and there must be sufficient space between the eyes and from them to the front of the head. The headgrowths (wen) of fry may take at least a year to develop. The young possess broad foreheads and square noses generally produce better wens. Mature Ranchus can reach between 15-20cm/ 6-8" in length. This fish is so named because it was said to have arrived in Japan through the Ryukyu Islands that lie between Taiwan and Japan. It is a hardy and attractive variety with a pointed head and pronounced hump on the back behind the head. It may be long-finned or short-finned, with either a triple or quadruple tail. The dorsal fin is high while the caudal fin is often twice as long as the body. The caudal fin may also have three or four lobes. Ryukin can reach up to 20cm/8". Also known as the Demekin in Japan, this is a fancy goldfish characterised by protruding eyes. Variants include the Globe eye and Dragon eye goldfish. Apart from those eyes the Telescope is similar to the Ryukin. Because of its poor vision this fish should not be mixed with more active goldfish varieties and should be housed in an aquarium without sharp or pointed objects. 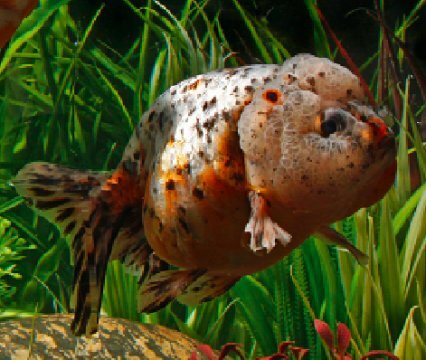 This is a fancy goldfish characterised by a prominent raspberry-like hood encasing its head. The hood or headgrowth encases the whole head, except for the eyes and mouth. The headgrowth of young fry may take one to two years to develop. Orandas can reach 20-31cm/8-12.2" but a specimen from China, named Bruce after the late actor and martial artist Bruce Lee, reached over 37cm/15" in length. Deep bodies, long, flowing finnage and protruding eyes identify these goldfish. There are veil tail, broad tail and short tail moors, and they possess metallic scales with a velvet-like appearance. Some claim that Black moors revert to metallic orange when exposed to warm water temperatures. These fish can range from lighter grey to a dark black, and most don’t stay pure black. Many also change from having a rust-coloured underbelly to one with orange splotches. This item first appeared in the May 2010 issue of Practical Fishkeeping magazine. It may not be reproduced without written permission.